Deeplas and other key suppliers supported BEK Plastics at the event held at the company’s new branch at Unit D2, Sharon Road, Dettingen Way, Bury St Edmunds. 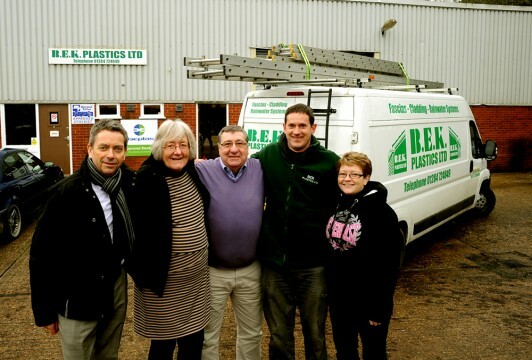 Following the move to a larger unit, BEK Plastics has been able to significantly expand its Deeplas offering. This will make it even easier for customers from across Bury St Edmunds to purchase the full Deeplas range in branch. BEK Plastics now stocks the full range of Deeplas products including its premium quality fascia and soffit boards, along with cladding, architraves, angles and trims. Twinson® decking from Deeplas is also stocked by BEK Plastics as part of its commitment to offer customers a one-stop-shop. During the customer event, the Deeplas team had a full range of products on display in the new store and were on hand to answer questions from customers looking for a high quality product and service solution. BEK Plastics has seen a continual increase in sales of Deeplas products over the last few months. Adding further Deeplas product lines to their offer has already resulted in the company winning several new customers. Deeplas foam products have a long established reputation for quality. The range is BBA (British Board of Agreement) and CSTB certified, and carries the BSI Kitemark. White PVC-U products from Deeplas are guaranteed for up to 20 years against discolouration, warping and cracking. Foiled profiles carry a ten-year guarantee. Twinson® decking from Deeplas combines the advantages of timber and PVC-U in a single decking product to provide the natural appearance and warmth of wood with the low maintenance and durability of PVC-U. Deeplas operates its own roofline and cladding installer scheme. The Deeplas Premium Installer Scheme is an accredited programme that ensures all its PVC-U roofline and cladding products are fitted by trained professionals to consistently high standards. To find out more about Deeplas, contact the Deeplas customer services team directly on 0800 988 7309.